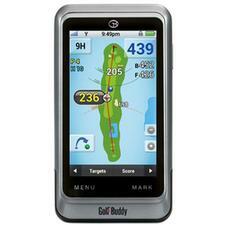 Golf Buddy PT4 Handheld GPS ( No Annual Fee) - See Price in Checkout - GolfersEdgeOnline.com - Best Golf Equipment On The Web! No annual or download fees. Precise distance to any target. Score tracking module (up to 4 players). Preloaded with 37,000+ global courses. Improved high contrast 4 inch TFT-LCD screen. Pin placement / movement functionality. Shock and water resistant case design. Lithium-ION Rechargeable Replaceable battery with 10 hour battery life. Multi-lingual (English, French, Spanish, Italian, German, Japanese, Chinese, Korean). Size: 2.7×5.0×0.59 (when battery is installed). If you have any more questions about the Golf Buddy PT4 Handheld GPS ( No Annual Fee); do not see the model you are looking for; need custom options; or prefer to not purchase online, then please call us at (630) 656-1291.